Many first-time Chihuahua owners find themselves at a loss, when it comes to training their Chi. These dogs may be tiny, but they certainly don’t act that way. Although the techniques for training a Chihuahua are slightly different to those you would use on a bigger dog, it is possible to train a Chi to respond to, and obey basic commands. Most Chihuahua owners find that it is better to train their precious Chi’s themselves. Firstly, there is the breed’s characteristic loyalty to their owner to consider. This already creates a strong bond and the relationship is better defined, if the Chi owner is directly involved in training. Dogs respond to the tone you use and your body language, when you give commands. Your dog may become confused with the way in which you give commands, in comparison to the way the dog trainer does. Another thing to consider, is that at a training school, your Chihuahua may encounter other dogs during training, since dogs are sometimes trained in groups. If your Chi has not been properly socialised, a fight may start and Chihuahuas are known for their inability to “size up the opposition”. Your Chi will most likely be injured in such an altercation. Of course, not all dog training institutions are bad, there are schools that specialise in training small breeds, or trainers who work with one dog at a time. Just do a bit of investigation before you hand your Chi over for training. It is generally best to start training your Chihuahua puppy after they are four to six months old. Starting training too soon, can lead to your Chi being unable to fully grasp what your commands mean, and will actually cause a regression in learning. Training will take longer than it should; this is similar to trying to toilet train a child too young – potty training takes a lot longer. 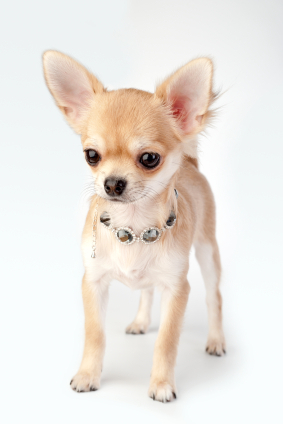 Basic manners and proper behaviour, as well as housebreaking, can be taught as soon as you bring your Chihuahua home. In particular, crate training is highly recommended for Chi’s. Firstly, it is an effective method to train them to use the designated ablution area, and secondly, a secure bed in a crate is a very safe place to be for a tiny Chihuahua puppy. It is really easy to accidentally step on your puppy – no matter how careful you think you are. Keeping your puppy safely crated in the late evening will prevent mishaps. When you start training your Chihuahua to obey commands, limit your training time to fifteen minute sessions. Your Chi cannot concentrate longer than that, and neither can most puppies. They tend get bored and restless; anything you try to teach them after 20 minutes, will be lost on them. Your Chihuahua is small and relatively delicate in comparison to other dogs. Together with their strong feelings of loyalty and natural temperament, they do not respond well to punishment, especially physical punishment. It is better to use the “reward and ignore” system of puppy training. Make sure that you have plenty of small tasty treats on hand, to reward your Chi when new commands are mastered. Remember that it is very easy to over-feed your Chihuahua, so it is another reason to keep your training sessions as short as possible. Investing time in training your Chihuahua is rewarding: you Chi will be better socialised with other dogs and your commands will be obeyed, which will make your Chi more manageable. A well-disciplined Chi is easier for your friends and family members to like and accept. This is important to your social well-being, because Chihuahua owners get very attached to their pets and as a result, your Chi will be in your presence almost continuously, when you are not at work. A news article about a Chihuahua joining the Japanese Police Force appeared just months before the earthquake and tsunami disaster in Japan, in 2011. The police wanted to train a dog for one of their K9 units, to conduct search missions in buildings and sites that have been hit by earthquakes. Momo (translated to Peach) the long-haired Chihuahua puppy, was chosen, despite going up against a whole range of excellent dog breed for the job. Police forces around the world use various dogs for many tasks, such as search and rescue, picking scents for trails and for sniffing out contraband and explosives. This is the first time that the Japanese Police have started training a Chihuahua for police work. It is probably the only Chi in active service of any police force in the world. The police representative said that the Chi was an excellent choice, due to the small size of the dog, making it easy for the Chi to navigate through small openings in rubble and collapsed structures. Momo weighed in at 6.6 lb and was seven years old when recruited. Active duty began in January 2011. This goes to show that a Chihuahua can be trained to do anything another breed of dog can do, it just takes effort and patience!